What it is: Apple recently discontinued their AirPort WiFi routers, so you need to find a third-party solution instead. Although WiFi is there crucial link keeping computers, tablets, and even smartphones connected to the Internet, Apple chose to let their AirPort WiFi routers languish until they finally announced they’re discontinuing this product line. That means if you want a WiFi router, you’ll have to rely on a third-party solution instead. Apple likely dumped their WiFi routers because third-party solutions were cheaper and updated more often. Apple didn’t update their AirPort products often so they usually fell behind compared to their competitors. MU-MIMO (Multi-user, multiple-input, multiple-output technology) allows a Wi-Fi router to communicate with multiple devices simultaneously. This can reduce choppy video and continual buffering that creates a stop and go experience when viewing videos or playing online games. This is the feature you need to look for to improve your WiFi experience. 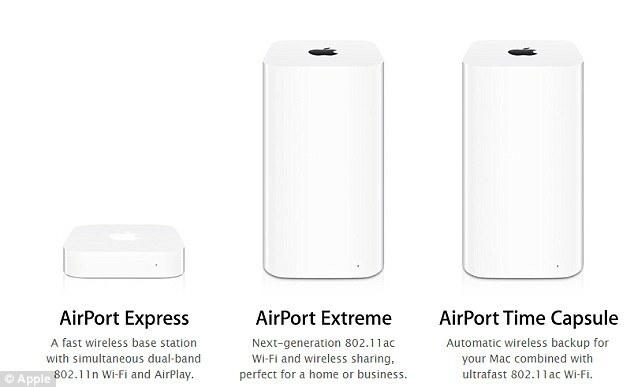 So is Apple dropping their AirPort routers a big problem? Not really because Apple didn’t offer anything that third-parties couldn’t offer just as well. Apple excels when they offer hardware that rivals can’t duplicate or compete against. WiFi routers need to follow a standard so third-parties offer better solutions than Apple ever did. While Apple may be selling AirPort routers cheaply to get rid of them, it’s probably not a good idea to get one since you’ll be buying obsolete technology. Stick with a newer WiFi router even if you have to pay a little more. You’ll be happier in the long run. To learn more about MU-MIMO and why you want it in your next WiFi router, click here. What it is: Apple recently filed a patent for eye-tracking technology. In 2017, Apple acquired SensoMotoric Instruments (SMI), an eye-tracking firm. SMI had been working on smart glasses where images are beamed directly on to a user’s retina. By pairing smart glasses with an iPhone, such eye-tracking technology would let people see images without unlocking and view their iPhone screen. Eye-tracking technology is essentially a new form of user interface. Just as touch screens eliminated the need for a mouse, so will eye-tracking eliminate the need to physically touch a screen to give commands. Eye-tracking, combined with voice commands, creates a hands-free computing environment. Eye-tracking requires smart glasses, so this is more evidence that Apple is working on smart glasses that will rely on augmented reality to display images to a user without blocking out the real world. For example, imagine looking at an unfamiliar street. Augmented reality can display directions so you can see your surroundings and see the direction you need to go. Currently, dating apps help people get together, but augmented reality would let everyone broadcast their availability to others. Imagine seeing a certain color, icon, or message floating over a stranger’s head, letting you know in advance who that person might be. Then you could connect through chats until you’re both ready to meet in person. Right now, augmented reality requires holding up an iPhone or iPad in the air so you can view the screen. This ties one hand to holding your smartphone or tablet. Tomorrow, you’ll be able to view augmented reality just by viewing it projected on your retina through smart glasses, freeing your hands to do something else. Eye-tracking technology may be years away from implementation, but it’s definitely coming as part of a smart glasses user interface. Whatever augmented reality can provide in the near future on the iPhone or iPad, it will do much better on smart glasses. We just have to wait for it. To read more about Apple’s eye-tracking patent, click here. What it is: When companies give employees a choice of devices to use, most choose Apple products. In the old days, IT departments used to dictate the equipment workers could use. Typically that meant Blackberry mobile phones and PCs running Windows. The goal behind such standardization was simply to make life easier for the IT department, regardless of what other departments really needed. This essentially was like having the tail wag the dog. When the iPhone appeared, people started demanding iPhones. Once people got used to the simplicity and reliability of the iPhone, they started gravitating towards the Macintosh as well. 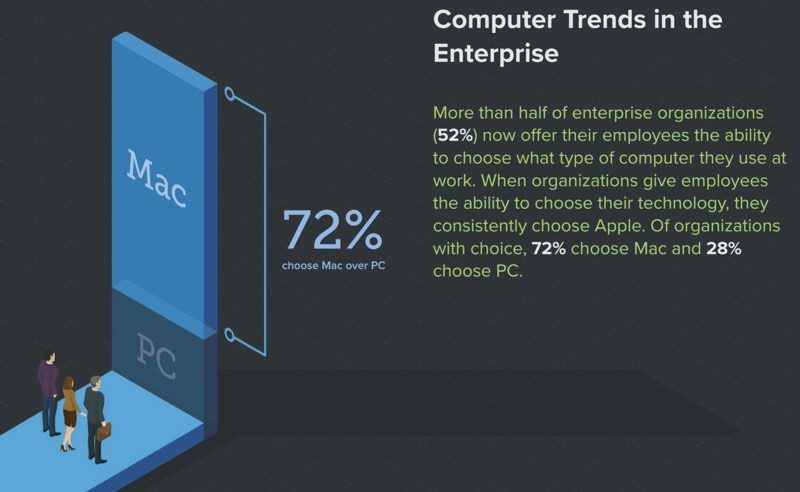 Now the latest survey shows that when given a choice, a large number of workers prefer using a Macintosh over a Windows PC and an iPhone over an Android smartphone. Smart companies know that by making workers happy, they’ll get more productivity out of those workers and attract and keep workers. While Windows PCs still dominate the enterprise, the steady growth of the Macintosh means that more people are becoming familiar and comfortable using the Macintosh as well. At one time, the future was anything related to Microsoft. Today, the future is anything related to Apple, Google, and Amazon. Microsoft is becoming an afterthought. Microsoft will still be around. They just won’t be as influential and dominant as they once were. So if you want to increase your chance of success in the corporate world, don’t focus solely on Microsoft or Windows. Broaden your skills to understand iOS, macOS, Linux, and Android. That’s just the future. To see what happens to people who don’t follow the future, just look at all those people who once insisted mainframes and minicomputers would always be dominant. That’s the future of people who still insist that Windows will always be dominant. 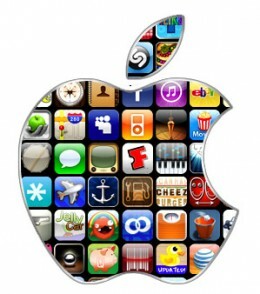 To read more about the growing appeal of Apple products in the enterprise market, click here. What it is: The latest rumor claims that Apple will allow iOS developers to create macOS apps easily. One of the problems with having multiple operating systems is that you have to create separate apps for each operating system. Even developing an iPhone app means modifying it slightly to run on an iPad properly. When you consider the desktop computer world with the mobile computer world, the differences in operating systems creates more of a challenge. Microsoft tried to get developers to create apps for both Windows on the desktop and Windows Phone on smartphones (and Windows RT on tablets). This fragmented policy failed because creating for three different operating systems that had little in common besides the name simply took too much work. Now Apple faces that same dilemma with macOS and iOS. In the mobile computing world, iOS dominates on the iPhone and iPad. In the desktop computing world, macOS has never seriously challenged Windows. The Macintosh is loved by many users for its reliability and ease of use, but it will never take over the Windows market. That’s why Apple is looking at ways to let iOS developers create macOS apps without a lot of work. What that means exactly remains mysterious, but the main goal is to let iOS developers create macOS apps with little extra work. That way more people will create macOS apps to go along with their iOS apps. This means Xcode will likely do much of the user interface design automatically so developers can focus on writing Swift code to make their apps actually work. The big question is how well will this work and will it create shoddy-designed macOS apps that feel like clumsy ported versions of iOS apps. What apple is doing is simply giving in to the inevitable. macOS will never be a dominant operating system but iOS already is a dominant operating system. So it only makes sense to focus on expanding iOS and focusing less on macOS. If you want to create apps for the iPhone and iPad, you want to learn Swift and use Xcode because only Apple will make this transition as painless as possible for iOS developers to create macOS apps. In the long run, the future is really iOS, not macOS. If you want to write an app, focus on iOS first and macOS second. The future is iOS, and that’s never going to change no matter what. To read more about the rumor that Apple will let iOS developers create macOS apps easily, click here. What it is: Verizon reported that the wireless Apple Watch helped boost subscriber revenue. When Apple first introduced the iPad, it lacked a camera. Now every iPad comes with a camera and people would likely not buy an iPad model if it lacked a camera. That shows how a feature once considered a luxury has now become a necessity. With the Apple Watch, you needed an iPhone to make and receive calls. However the latest Apple Watch can be completely wireless, which means you can make and receive calls without needing an iPhone nearby at all. While this might seem like a luxury today, tomorrow it will seem like a necessity. The future of the Apple Watch isn’t as an iPhone accessory but as a stand alone device. For many people, an iPhone (or any smartphone) is overkill when all they want to do is make and receive phone calls. That’s why you see ads in magazines targeting senior citizens that sell simple mobile phones that do nothing but make and receive calls. For many people, that’s all they want to do. That’s why the Apple Watch can be perfect for such people. With no distractions on the screen to get in the way, people can simply use an Apple Watch to make and receive calls wherever they are. Since the Apple Watch is strapped to your wrist, there’s no chance of losing or misplacing it. Some people will always want the complexity of a smart phone while others may prefer the Apple Watch to make and receive phone calls instead. Then there will be those who may want both devices. The Apple Watch has gone from a curiosity to defining the wearable computer market. With real-time health monitoring the main use for the Apple Watch, the simple ability to make and receive phone calls easily could be a close second. If you think you can’t use an Apple Watch, think again. An Apple Watch will likely become a popular necessity for the future, much like almost everyone owns a smartphone these days. When people look back in the past, they may marvel that anyone would consider going through life without a wearable computer just like today’s kids can’t even think f a time when the Internet didn’t exist. Technology that seemed like a luxury in the past now seems like necessity in the present. Nobody talks about the Apple Watch being a flop any more because it’s obvious that it isn’t. You may think you don’t need an Apple Watch right now, but tomorrow you could change your mind. Just ask all those people who once thought they never needed a smartphone or a computer. To read more about how the Apple Watch helped Verizon keep from losing too many subscribers, click here. What it is: To celebrate Turkey’s National Sovereignty and Children’s Day, children are crating art using an iPad and Apple Pencil. The Apple Pencil paired with an iPad can be an artist’s tool much like a word processor has become a writer’s tool. To celebrate Turkey’s National Sovereignty and Children’s Day, Apple has created a video highlighting art that children have created using an iPad and Apple Pencil. While these children are obviously talented and likely spent many hours practicing drawing and painting with an iPad, it still shows how the Apple Pencil and an iPad can help people create art. For people who don’t care about drawing or painting, then an Apple Pencil may not be for you. For artists, an Apple Pencil can help you turn the iPad into an endless canvas that you can experiment with no matter where you go (just as long as your iPad has enough battery power). In the old days, artists used to draw on paper using pen, pencil, or various implements like chalk. This is equivalent to writers using pen or pencil with paper notebooks. It’s possible but slow and less forgiving. A word processor gives writers the freedom to create and edit. 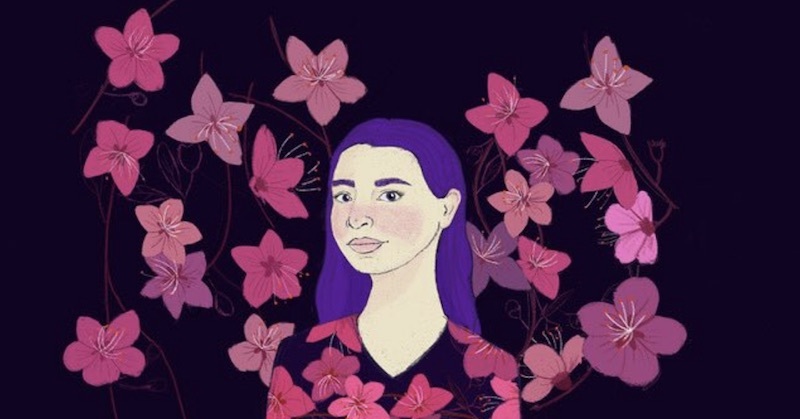 Likewise, an iPad with an Apple Pencil gives artists the freedom to create and edit art. The Apple Pencil shows how versatile the iPad can be, changing in form from a browser to a newspaper or book to a typewriter or a painting canvas. The reason the iPad helped kill netbooks is because the iPad is far more versatile. Paired with the Apple Pencil, the iPad is even more flexible for whatever you want to do. While sales of iPads have slowed recently, the table category is never going to go away. The iPad has defined a new computing category and the Apple Pencil works because it’s an accessory, not a necessity. In the old days, mobile devices like Palm Pilots required a stylus to choose commands. With the iPad, all commands can be given through touch alone. The Apple Pencil simply makes tasks more convenient, but you can get by perfectly well without an Apple Pencil. That’s the key to designing products well. To read more about Turkish children creating art with an iPad and Apple Pencil, click here.